Home arts corporate corporate work decoration design My Working station Office second Second Year Anniversary work working area workplace workstation The Evolution of My Workstation! In accordance to my second year anniversary celebration here in my company, I promised you that this February, one of my three main dishes here in The Rock Land is all about my humble beginning in my company! One of the important part of the company where you perform your daily work is the workstation! Our workstation or cubicle can we somewhat called as our second room next to our personal rooms in our homes. Therefore here in my company, the most important place for me is my own workstation! For my two-year tenure here in my office, my workstation also grows...it evolves! Feb. 11 to June 2008 - "My First Workstation"
June to Sept. 2008 - "Brand New Workstation in the New Office"
Sept. 2008 to Nov. 2009 - "My Solo Artistic Mini-Office"
In the Other Side of My Artistic Working Area...! Nov. 2009 to Present - "A Wider More Expose Station"
What can you say about this evolution? Which of the era above you like the most?! 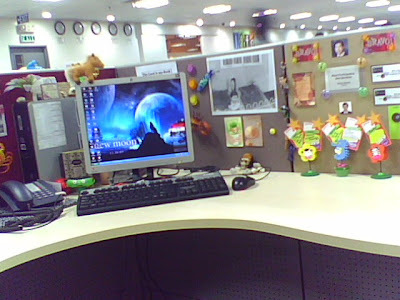 (February 11 - June 2008) - My very first workstation was in our former main office in RCBC Tower, Makati City. There, my area was too plain and simple without any decorations! It has a plain green walls that surrounded me. My table was a shinny light-brown with varnish! My first computer here was the old black CRT! 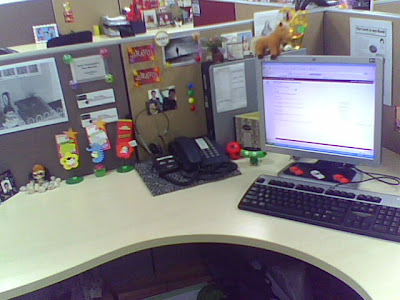 (June - September 2008) - Then, when we transferred to our second office here now in McKinley, The Fort, I have also located into a new workstation. This time the walls were composed of three colors: red, brown, and gray that were fine to the eyes! My table then was a smooth plain white. There, I started to put decorations and arts in my place! Still my PC there was a CRT. (September 2008 - November 2009) - We made our first transfer within the office in September of 2008. Again, I was placed to the new workstation. But since it was within the same office, still same workstation style. In this area, I got my new LCD flat screen PC. This adds design to my area. It really saves space! I then used my extra space in putting more arts and designs in my work station! 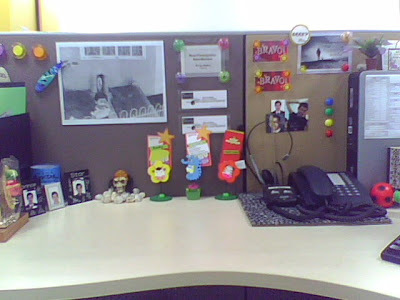 (November 2009 - Present) - I am now here in my present workstation! Well, do I need to describe it more since I already featured it here in my previous post?! Hmmm...maybe the only thing that makes difference is that it is more wider and more expose to the people behind me! Still my arts and designs are similar to my previous but it is more attractive now! I don't know when we will transfer again to a new workstation. But for now, I still keep my area more beautiful and attractive! And take note, I always ensure my area to be fragrant and disinfected since everyday, I always rub alcohol on it! My table then became really smooth! I prefer your present workstation with the new LCD. By the way, what's the brand of your LCD? It's silver in color and I'm searching for that kind too, for my home.